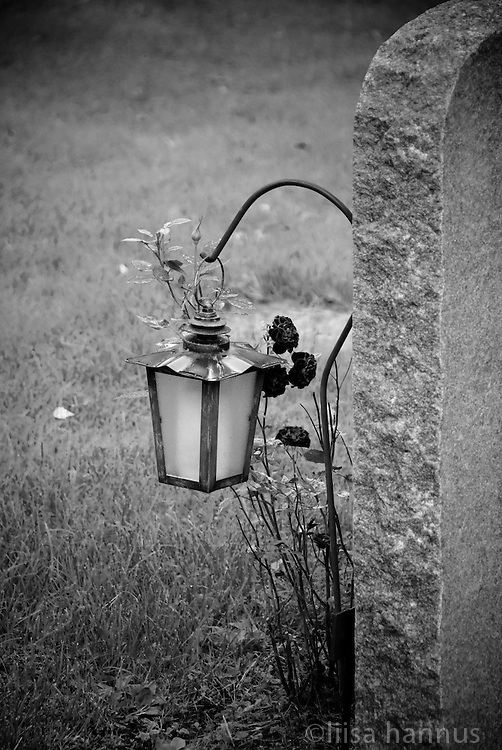 Lantern and roses in front of a grave stone in Skogskyrkogarden, Stockholm, Sweden. Following the European custom of decorating grave sites, roses grown around a lantern that has been placed in front of a grave stone at Skogskyrkogården, or the Woodland Cemetery, in south Stockholm, Sweden. The cemetery was designed by Gunnar Asplund and Sigurd Lewertz g opened in 1920. The architects' use of the natural landscape has had a profound effect on cemetery design throughout the world, and in 1994 Skogskyrkogården was named a UNESCO World Heritage Site.